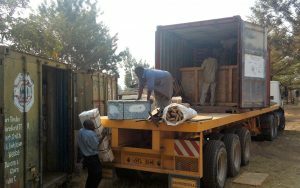 After three months at sea and on the road, plus a quick pit-stop at the port in Dar es Salaam, our eleventh container has arrived at our workshop in Mwanza. Seen here are Emmanuel and Saidi unloading. Hoping they had some help, as there were 18 tonnes of equipment and tools inside. Included were lathes and sewing machines for the two villages in our Rural Clusters Project. Many thanks to SIDO HQ staff in Dar for their speedy port clearance. 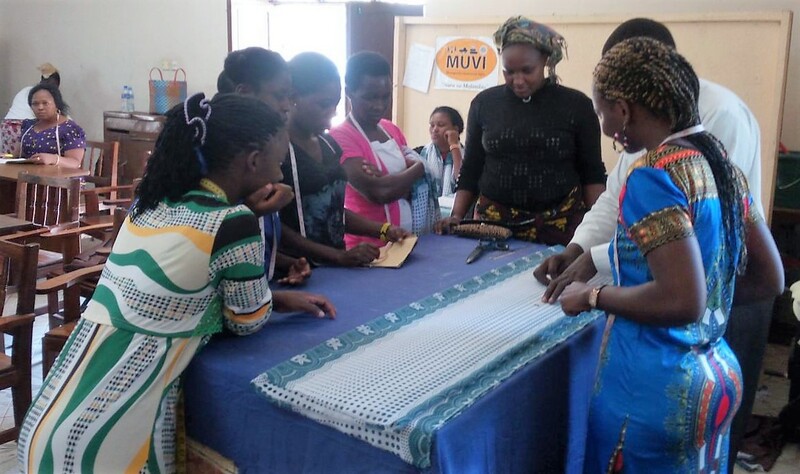 Fourteen tailors from the Rural Clusters project attended a three week training course at the Mwanza Sewing Machine and Training Centre. 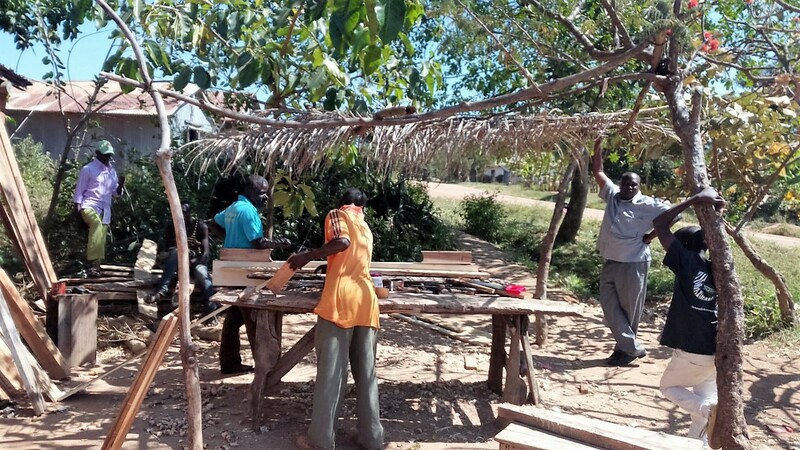 MSTC was established by our friends at Tools for Solidarity in Belfast, and is next door to our tool refurbishing workshop on the SIDO compound in Mwanza. On completion of their training each woman returned to her village with a treadle sewing machine. Included in our container were some electric zig zag machines in response to requests from the tailors groups. Although the two villages have electricity the supply is not reliable, so treadle machines are much valued. Jitihada Carpentry group at work in Namagonda with some of their new tools. 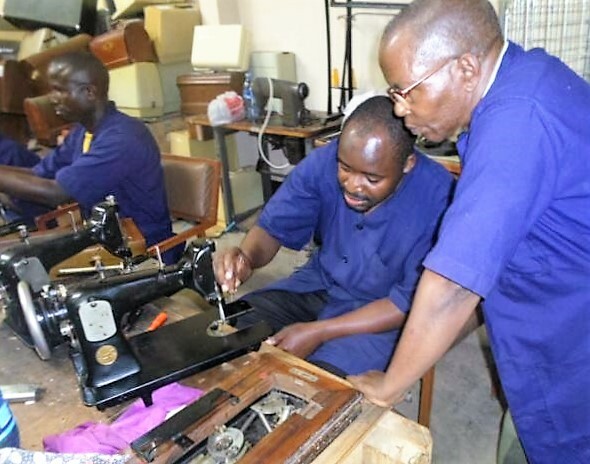 Dickson Shenkalwa, Technical Officer from Tanga region, attended training in Mwanza to learn about advanced maintenance of sewing machines. On returning to Tanga he will be passing on some of his new-found knowledge to women’s tailors groups in Pangani and other groups in the region. 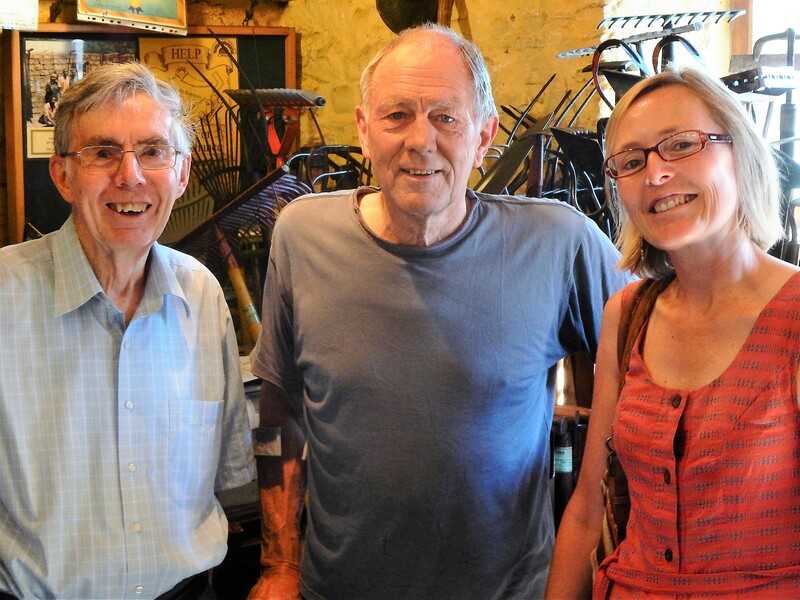 Christopher and Helen Carey visited our workshop last month, shown with co-ordinator Tony Care. Helen is back in the UK raising funds for the project she works for in Tanzania; the Safe House Project. This is run by Rhobi Samwelly and provides a safe place for young women fleeing from the threat of FMG. We have sent ten sewing machines, and a batch of garden tools to help them. 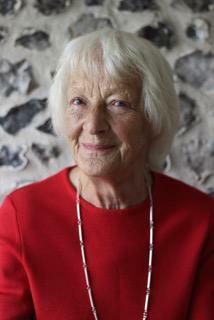 It is with great sadness that we are writing to tell you that Sue Gray has died. She had been ill for some time but has shown incredible strength and resilience during her illness, defying predictions of her longevity on numerous occasions and facing her last days with great humour and dignity. Sue was a long-time member of TFSR Cymru. She was a Board member from 1999 to 2010, and our Chair in 2002. She visited Tanzania with Tony Care in 2004 and made many friends there as she did everywhere. We will miss you Sue, you will be long remembered by all at TFSR Cymru. We spent eight great days at the Eisteddfod just down the road from our workshop. 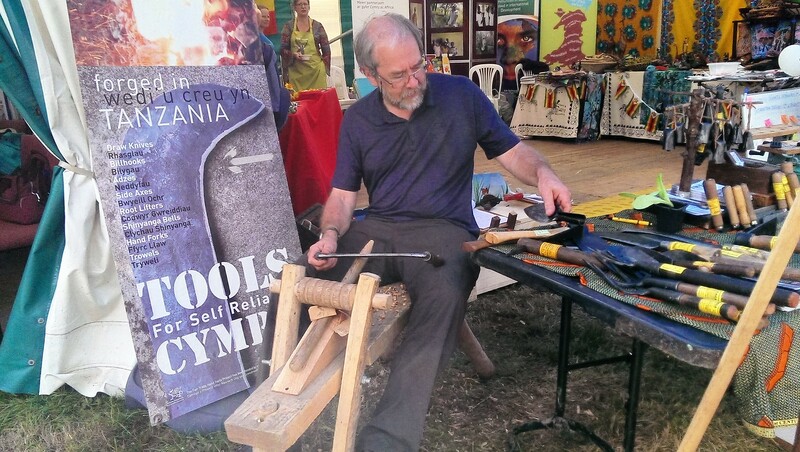 Here Andrew Helme demonstrates fixing handles to Fair Trade tools. He was one of fifteen volunteers who helped on the stall over the week. The stall was courtesy of HUB Cymru Africa who invited us and four other local organisations to join them. 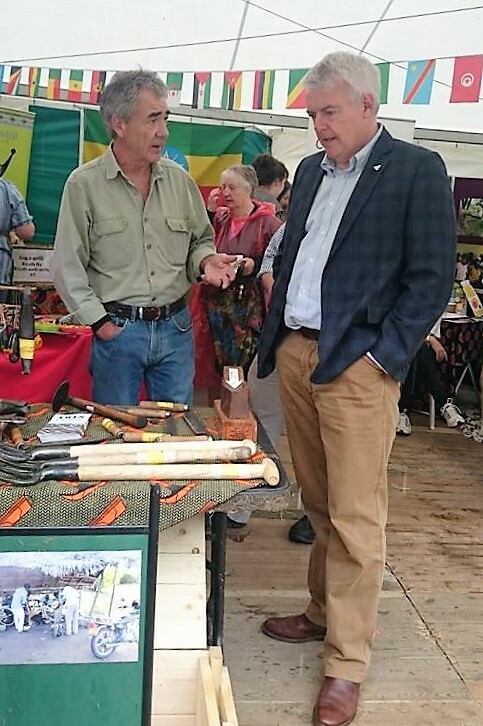 We raised over £1,000 selling Fair Trade tools and asking for sponsorship for tool kits. This all helps to make up the funding we have received from the HUB and other generous donors for the current project. BUT we still need another £6,000 to cover the whole cost of the project which runs until January 2018.